There's no quick fix to get a flat stomach -- it takes hard work and patience and no plan specifically targets stomach fat, notes Gina Neill, a clinical dietitian at Loyola University Medical Center in Chicago, in an article from "Men's Fitness." The real secret -- which is no secret at all -- is simply eating fewer calories and making healthier food choices. You can't pick where on your body you lose fat from, but you can burn fat from all over, including your belly. The first step to take in designing a fat-busting diet is to cut your calories. You need a calorie deficit of 500 per day to lose 1 pound per week. To work out how many calories you need to maintain your weight, the University of Maryland Medical Center recommends that active men multiply their body weight in pounds by 15 and active women multiply their body weight in pounds by 12. Sedentary men should multiply by 13 and sedentary women by 10. Take 500 from your result to find how many calories you need to eat daily to lose 1 pound per week, or take away 1,000 per day for a loss of 2 pounds per week. Make protein your best friend at breakfast. Eating more protein first thing means you're less likely to snack on fatty foods later in the day, according to a study published in a 2013 edition of the "American Journal of Clinical Nutrition." Start your day with fat-free or low-fat Greek yogurt mixed with berries and almonds, a ham and vegetable omelet, a protein shake and a serving or two of fruit, or a couple of pieces of lean grilled bacon on a tortilla. Keeping protein up is key at lunch too. 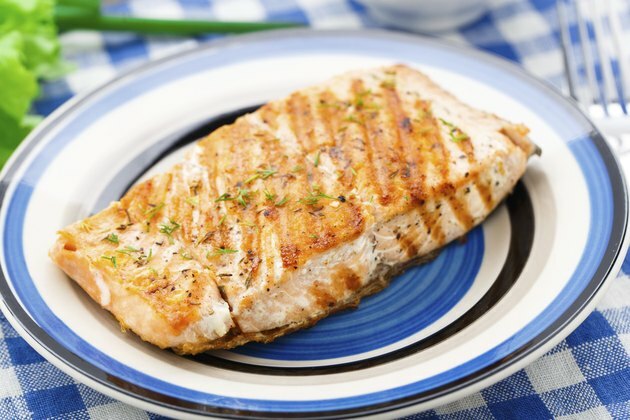 Base your lunch around a protein-filled food, such as turkey, canned tuna or salmon, or cottage cheese. What you have with your protein depends on your calorie intake. If you're active and have higher calorie needs, you may wish to go for a sandwich, bagel or wrap, some fruit and mixed nuts. If your calories are on the lower end, however, making a salad with your protein, or having a soup on the side will allow you to get a bigger, more filling lunch for fewer calories. You needn't go down the route of plain, boring grilled chicken breast and steamed broccoli every night to lose belly fat. Make your dinners more interesting to increase dietary adherence. "Fitness" magazine suggests lean steak and pepper tacos, a shrimp and avocado rice bowl, a vegetarian pizza made with a thin whole-wheat crust, salmon with a yogurt and cucumber sauce, or a tagine for your evening meal. Again, aim for a high-protein meal, with moderate amounts of healthy fats and whole-grain carbohydrates. If you like to snack between your meals, you can't go wrong with low-sugar yogurts or cottage cheese, fresh fruit, pre-cooked meat, reduced fat cheese, raw nuts, low-carb protein bars or whole-grain crackers. The main thing to consider when picking any food or meal is your total daily calorie intake -- you must consume fewer calories than you burn to shift your belly fat. If you don't feel like you're making progress, you're probably eating too much and not exercising enough, so drop your calories a little and start training more. Men's Fitness: Nutrition Q&amp;A: Can a Diet Really Target Belly Fat? University of Maryland Medical Center: How Many Calories and Fat Grams Do You Need? Source: How Many Calories and Fat Grams Do You Need? American Journal of Clinical Nutrition: Beneficial Effects of a Higher-pProtein Breakfast on the Appetitive, Hormonal, and Neural Signals Controlling Energy Intake Regulation in Overweight/Obese, "Breakfast-Skipping," Late-Adolescent Girls.